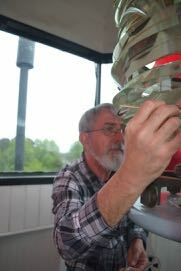 Workday: Calvert Marine Museum – April 22, 2017 – Chesapeake Chapter U.S.L.H.S. All stabilizes the prisms in the lens. The weather did not cooperate with us this weekend. We had to cancel the outdoor work which would have been at Cove Point and come up with a backup plan. 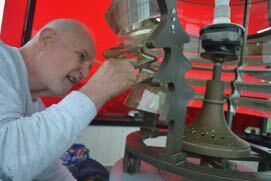 But the weather did not impact our main task which was to help to re-insert one of the prisms that had been dislodged from the brass frame of the 4th order fresnel lens at Drum Point. 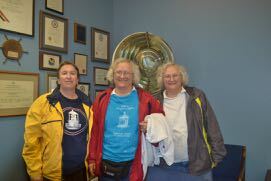 The museum staff found the fortunately undamaged prism on the floor of the cupola one day. We were lucky enough to have Al Smith, who had been on the Chapter’s lens team, come down from New Jersey and put the old skills to use. We had supplies from the previous work and soon the prism was restored to its rightful place. We were joined by Robert Hurry from the museum for the lens work. 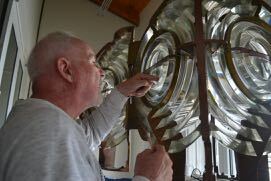 While Al was doing that the other volunteers helped spruce up Drum Point light for the season. It was a short, but productive workday. We also took a look at one of the other lenses that is in need of a little TLC. 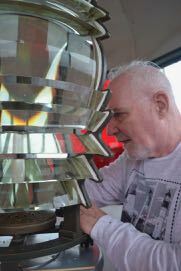 Museum employee Robert Hurry will take care of that after having watched and helped with the Drum Point lens. Al cleans debris out of frame prior to fitting prism. Robert Hurry from CMM caulks some of the prisms. All inspects the bullseye lens.